US President Donald Trump has called North Korea a “brutal regime” after the death of a US student who had been jailed there for more than 15 months. North Korea returned Otto Warmbier, 22, to the US last week, saying he had been in a coma for a year and that it was acting on humanitarian grounds. His parents said he had been subjected to “awful torturous mistreatment”. Mr Warmbier, who was jailed for trying to steal a propaganda sign from a hotel, did not regain consciousness. Is visiting North Korea too risky? President Trump said Mr Warmbier’s death had deepened his administration’s resolve “to prevent such tragedies from befalling innocent people at the hands of regimes that do not respect the rule of law or basic human decency”. South Korea’s President Moon Jae-in told CBS News on Tuesday it was “quite clear” that North Korea had “a heavy responsibility in the process that led to Mr Warmbier’s death”. 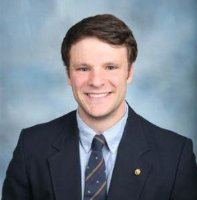 Otto Frederick Warmbier (WARM-beer; December 12, 1994 – June 19, 2017) was an American college student who was imprisoned in North Korea from January 2016 to June 2017 after being convicted of “hostile acts” against the country. Warmbier, then 21 years old, confessed to stealing a political propaganda poster and was sentenced to 15 years’ hard labor. The United States made diplomatic efforts to seek Warmbier’s release. A U.S. State Department spokesman said Warmbier’s harsh sentence was a response to U.S. sanctions against North Korea for its nuclear activities. According to his father, Warmbier’s confession was forced, and he was abducted by the North Korean government for political purposes. His father believes that he was “terrorized and brutalized”. Warmbier died on June 19, 2017, six days after his return to the United States. Otto Warmbier was born on December 12, 1994, to Fred and Cindy (née Garber) Warmbier and raised in Cincinnati, Ohio, to a family of American-Jewish descent and was one of three children in the family. His father, Fred Warmbier, owns his own business, a metal-finishing company, that was featured in Forbes for its rapid growth in 2015. In 2014, he contributed to the The New York Times‘ blog titled You’re the Boss about running a small business. Otto worked as an intern at the company from 2010 to 2013. Otto Warmbier graduated from Wyoming High School in 2013 as the class salutatorian. At the time of his trip to North Korea, he was a junior at the University of Virginia, where he was studying for a double major degree in commerce and economics and did an exchange at the London School of Economics. Otto was a brother of the Theta Chi fraternity. He was active in the Hillel Jewish campus organization at the University of Virginia, and had visited Israel in a Birthright Israel heritage trip for young Jewish adults. He had two younger siblings. Fred Warmbier said the China-based tour operator, Young Pioneer Tours, advertised the trip as safe for U.S. citizens. Danny Gratton, an adventurous British sales manager, met Warmbier in Beijing as the two boarded the tour flight to Pyongyang. The two struck up a friendship and were roommates on the trip. They stuck together from the time they got to Pyongyang until Warmbier was arrested. Warmbier traveled to North Korea for a five-day New Year’s tour of the country organized by Young Pioneer Tours. Ten other U.S. citizens were in his tour group. “Let’s arm ourselves strongly with Kim Jong-il‘s patriotism!”. Harming such items with the name or image of a North Korean leader is considered a serious crime by the government. A video purporting to show the theft was released by state-run Korean Central News Agency on March 18, 2016. In the 18-second low-resolution video, an unrecognizable figure removes the sign from the wall and places it on the floor, leaning it against the wall. This action is shown twice, followed by a higher-resolution picture of the sign on the wall. The face of the person removing the poster is not seen during the video clip. On January 2, 2016, Warmbier was arrested for theft just prior to departing North Korea from Pyongyang International Airport. Gratton witnessed the arrest. The others in his tour group left the country without incident. His crime was described as “a hostile act against the state” by the North Korean news agency KCNA. Warmbier was tried and convicted for the theft of the propaganda banner from a restricted area of the hotel. His trial included his confession, CCTV footage, fingerprint evidence, and witness testimony. “suffering from very severe financial difficulties”. He also said he was encouraged in committing his act by his desire to join the Z Society, a “semi-secret ring society” and philanthropic organization at the University of Virginia. I never should have allowed myself to be lured by the United States administration to commit a crime in this country. I wish that the United States administration never manipulate people like myself in the future to commit crimes against foreign countries. I entirely beg you, the people and government of the DPR Korea, for your forgiveness. Please! I have made the worst mistake of my life! Please! Think of my family. On March 16, 2016, two hours after U.S. envoy Bill Richardson met with two North Korean diplomats from the United Nations office to press for Warmbier’s release, Warmbier was sentenced to 15 years of hard labor. Human Rights Watch called the sentencing “outrageous and shocking”, while U.S. State Department spokesman Mark Toner said that it was clear that North Korea used arrested American citizens for political purposes despite its claims to the contrary. Sometime in the month following his trial, Warmbier suffered an unknown medical crisis that caused severe brain damage. 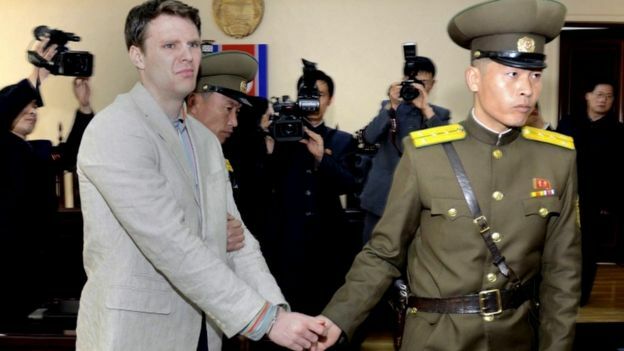 His condition was not conveyed to anyone outside North Korea, and Swedish envoys who represent the United States’ interests in North Korea were not able to see Warmbier after March 2016. In May 2017, Warmbier’s father said he and his wife wanted their son to be part of any negotiations between the United States and North Korea. On June 12, 2017, Rex Tillerson, the United States Secretary of State, announced that North Korea had released Warmbier. Tillerson also announced that the U.S. State Department secured Warmbier’s release at the direction of President Donald Trump. Tillerson said that the State Department continues discussing three other detained Americans with North Korea. Warmbier’s parents told The Washington Post that Warmbier was medically evacuated, saying they were told by North Korean officials that Warmbier had contracted botulism sometime after his trial and had fallen into a coma after being given a sleeping pill. They learned he was in a coma only one week before his release. Richardson was in contact with the family and said Warmbier urgently needed medical attention. After 17 months away, Warmbier was flown from New Chitose Airport to Ted Stevens Anchorage International Airport and then to Cincinnati Municipal Lunken Airport where he arrived shortly before 10:20 p.m local time on June 13, 2017, and was rushed to the University of Cincinnati Medical Center, where doctors tried to determine what caused his coma and if there were signs of recoverable brain function. Prior to his arrival, a doctor with the Cincinnati Health Department discussed Warmbier’s case and expressed skepticism over the claim that botulism or a sleeping pill caused the coma. His father reported that he had received a call from President Trump at his home asking about the welfare of his son and the family. He also reported that Tillerson and U.S. special representative Joseph Y. Yun had made the transition possible. On June 15, 2017, physicians at the University of Cincinnati Medical Center stated that Warmbier had suffered extensive brain damage, which is consistent with a cardiopulmonary event rather than a head injury, and there was no sign of physical abuse. Warmbier’s father held a press conference that day, but declined to answer a reporter’s question as to whether or not the neurological injury was caused by an assault, saying he would let the doctors make that determination. He stated that they did not believe anything the North Koreans had told them. Neurologist Daniel Kanter, director of the neurocritical care program at University of Cincinnati Medical Center, said on June 15 that Warmbier was in “a state of unresponsive wakefulness”—a condition commonly known as persistent vegetative state. He was able to breathe on his own, and blink his eyes, but otherwise did not respond to his environment. Magnetic resonance imaging (MRI) revealed he had suffered extensive loss of brain tissue throughout his brain. Kanter stated that Warmbier’s brain injury was typical of a cardiac arrest that caused the brain to be denied oxygen. Doctors also said that they did not find any evidence of physical abuse or torture; scans of Warmbier’s neck and head were normal outside of the brain injury. Doctors said they did not know what caused the cardiac arrest, but that it could have been triggered by a respiratory arrest. Brandon Foreman, a neurointensive care specialist at the hospital, confirmed that there was no sign of a current or past case of botulism, which can cause paralysis but not a coma. Medical records from North Korea showed that Warmbier had been in this state since April 2016, one month after his conviction. During his release, the North Koreans provided a disk containing two MRI brain studies, dated April and July 2016 showing damage to the brain. Warmbier died in the hospital at 2:20 p.m. on June 19, 2017, at the age of 22. His parents and two siblings survived him. His family issued a statement expressing their sadness, thanking the hospital staff for their actions.